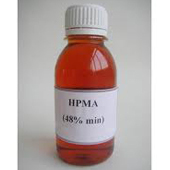 HPMA's relative molecular weight is 400-800. It is non-poisonous and easily soluble in water. Hydrolyzed Polymaleic Anhydride will decompose when the temperature is higher than 330℃. Homopolymer of maleic acid is applicable in alkaline environment. Because of the good scale inhibition and resist to high temperature, HPMA is widely used in braising device and low-pressure boiler of sea water desalinization and industrial circulating cooling water. Hydrolyzed Polymaleic Anhydride is erosive. Its erosion effectiveness will be better if compounded with zinc salts.